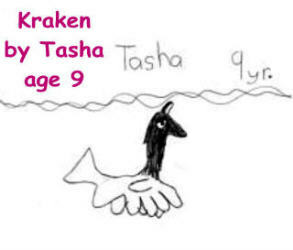 What is a Kraken? 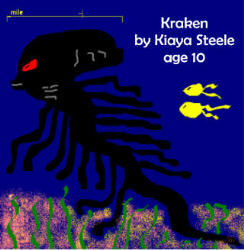 No one knows exactly what an old kraken looks like - so we asked for some help from our readers. 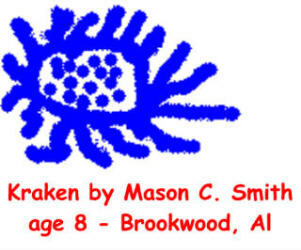 Their art work is featured here. 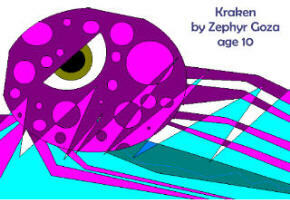 You can join in the fun by making a Kraken Kite. We'll show you how! When Stormalong was still just a lad, he was already 5 fathoms tall  that's about 30 feet (give or take a yard) to us landlubbers. He strolled down to the wharf and got a job on a ship. He was hired to stand watch  after all, he could see much farther than anyone else. Not long after the ship set sail, Stormy spotted something on the horizon  a pirate ship approaching! He warned the captain and they tried to outrun the pirate ship, but it got closer and closer and closer. Finally, Stormy got an idea: he had the crew pour molasses on the deck, so when the pirates came aboard, they got stuck in their tracks and were captured easily. For his cleverness, Stormy was promoted to First Mate. Then one day the ship was attacked by a humongous kraken that's a mythical sea creature that is half octopus, half sea-serpent and half something else. It hacked at the hull, crunched at the keel and slurped at the sails, and generally did a lot of damage to be so mythical. Well sir, Old Stormy knew that it would take one legend to defeat another, so he jumped into the water with a mighty splash that started a tidal wave in China. 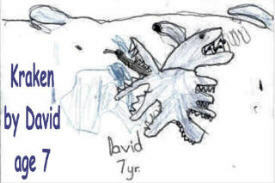 And he swam down, down, down to battle the fabled monster. For hours, the crew stared anxiously at the water, watching the bubbles rise to the surface. Finally, Stormy came back up, looking mighty serious. "I've failed", he said at last "he got away". He went straight to his cabin and stayed there for many days, without talking to anyone. The cook tried to cheer him up by bringing him his favorite meal: a whole schooner full of clam chowder, twelve dozen ostrich eggs (a truly GROSS snack) and a barrel of coffee. But for once, Stormy had no appetite. Finally, he came out of his cabin and said, "I guess I wasn't cut out to be a sailor. I'm going to dry land to try something new." So, he went to Michigan  it took him a couple of hours to walk there from Boston  and he tried his hand at farming. He got along just fine until the winter came, and the snow fell up to his knees. He didn't like snow too much, so he headed south to Texas where he tried his hand at ranching. For a while he was quite at home on the range  he even made up a little song about it. But one day, a twister came, a rip-roarin', rootin-tootin', snip-snortin' tornado that leveled everything in its path. It ripped up huge trees by the roots and turned them upside down. It picked up houses and set them on top of those upside-down trees. It tied Old Stormalong's hair in knots. "Hey neighbor! ", said Stormy to a friend, "What do you do around here when a twister comes?" "We just hold on tight", was the response. So Stormy hung on to a barn for dear might. But that twister lifted the barn up and sent it flying through the air. Stormy took his 20 foot bandana and used it like a sail, guiding his air boat until it landed with a splash in the gulf of Mexico. It was then that he decided that things weren't working out for him on land and maybe he was meant to be a sailor. So Stormy had his own ship built, and of course it was the largest ship ever to set sail. The deck was so long that its crew had to use horses to get from one end to the other. The sails were so big they had to be stitched together in the desert, because it was the only flat surface big enough. The mast was so high that it had to be folded down to let the moon pass by. The ship was so wide that when it tried to sail through the English Channel it got stuck. The crew had to rub soap all over the outside of the hull so the ship could squeeze on through. To this day there is still white soap all over the cliffs near Dover. One day, they were sailing along as smooth as a teacup, when all of a sudden, something started hacking at the hull, crunching at the keel and slurping at the sail. 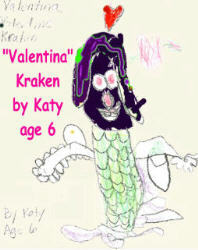 It was that pesky old myth again, the kraken. But this time Stormy didn't jump in to do battle with it; instead he tried a trick he'd learned on land. Grabbing a huge coil of rope from the deck, he tied a big loop in the end and twirled it around and around like a lasso, the way he'd seen the cowpokes in Texas do. Then he slung it around the kraken's neck (or what looked like one) and snagged it tight. Well sir, this made the kraken so mad that he began thrashing around like crazy trying to get free, but Stormy held on tight. The kraken took off like a rocket trying to outrun the ship but Stormy kept holding on so the ship was just dragged along like a water sleigh. The kraken wasn't watching where he was going so he got caught in a giant whirlpool and it dragged him into the center. The ship of course followed, going around and around faster and faster and faster. At last Stormy let go and the ship was shot out of the whirlpool like a stone from a slingshot. And the kraken went down, down, down never to be heard from again - as far as anyone knows. Old Stormalong kept sailing the seas for many years, and had many other great adventures, until he was very old. One day as his ship was anchored near Boston; he saw a tiny vessel approaching that had smoke rising from it. Fearing that it was on fire, Stormy scooped up some water in his hat - which was about the size of an average yacht- and dumped it on the smoking ship. He didn't realize that it was actually a newfangled invention called a steamboat. Well, the captain of that steamboat was furious because Stormy had drowned his engine. He challenged Stormy to a race from Boston to Liverpool to prove that his steamboat was faster than an old-fashioned sailing ship. So off they went. But not to worry, Stormy won by half a length - which for him was a couple of miles. But he had to work so hard to run the race, that the old giant slumped at the wheel, and never awoke. The greatest sea captain of all time had passed into legend. In American folklore, just about every occupation has its legendary, larger than life hero. Lumberjacks have Paul Bunyan. Cowboys have Pecos Bill. Farmers have Febold Feboldson. And sailors have Old Stormalong. . . .